Negatives: While he is learning the complex defensive schemes of the Celtics, the basic fact remains that Bass is not a great defender. He has definitely improved this season playing with KG and for Doc, but some weaknesses still remain. He is not tall and can be shot over by taller players. Positives: Wilcox is an above average offensive player who brings energy off the bench for the Celtics. He is the best at getting out in transition and Rondo rewards him with alley-oops most of the time. Big time energy player for the Celtics, but his production depends on his health. Negatives: Has been injury prone throughout his career, and it hasn’t changed this year. He is also undersized and when he finds himself on the floor with someone other than KG, the Celtics begin to get manhandled in the post. 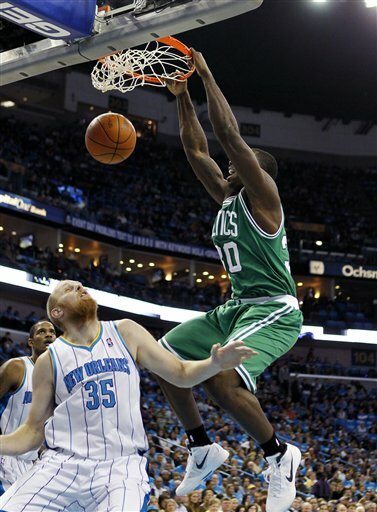 Positives: Johnson has been a nice surprise for the Celtics. As many people wrote him off as a prospect until he put on some weight, Jujuan has shown his scoring ability translates to the NBA. John Hollinger isn’t surprised as he said that he will be a solid role player for years to come. He has been a good help defender and is learning Doc’s schemes well. Negatives: For being 6’10 he needs to get his body weight up. He is way to skinny to bang with Gerald Green nevertheless players like Amare Stoudemire. Needs to work on his rebounding a little bit, but I feel it will come when he starts filling out his body. Should the Celtics trade Rondo? This entry was posted in Celtics and tagged boston sports blog, brandon bass, celtics, Chris Wilcox, Gerald Green, Jujuan Johnson, Power Forwards by leibo4. Bookmark the permalink.